In 2010, three San Francisco Bay Area musicians decided to create a rhythm section devoted to their own compositions and standards. After recording its studio demo in 2010, 3BE (Belasco, Bennett, and Berthiaume) began performing publically. Check out their new CD, "Three Musicians", under "The Bill Belasco Trio" name. BILL BELASCO, Bill started drumming at the age of 3 and went on the road with “The Graduates”, a brass rock band, at the age of 17. In 1974 Bill finally settled in The Bay Area. Bill studied with drummers George Marsh and Tony Williams. Today Bill is a well respected drummer on the San Francisco music scene. 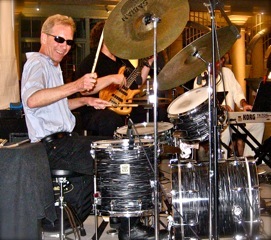 After playing drums with the Pickle Family Circus for fifteen years, Bill played with such diverse groups as The Sharmen Duran Trio, and Mario Suraci. Bill currently freelances with Faye Carol and Tony Lindsey and The Moodswing Orchestra. Bill studied timbales with Louie Romero and Afro-Cuban theory with Michael Spiro. Bill has played with The Kenny Dorham Project at Yoshi’s, with arrangements by trombonist Jules Rowell. Bill’s latest projects include working with Paula Harris, Betty Roi, and Jim Passard. Contact Bill at billbelasco4u@sbcglobal.net.